We set off to take a photo on the beach in mid October despite the awful weather because this was the last opportunity of the year. We had planned to take the picture back in 2007 when I met her shortly after opening my gallery in Orvieto, though something had always conspired to postpone time after time. She loved the sea and would be photographed nowhere else, so not withstanding the wind and rain we decided to chance it. When we arrived at Montalto di Castro my chosen location on the Tyrrhenian coast, the fisherman would not take us across the river Fiora to the other side, it was too fast, too much in flood and loaded with tree trunks and flotsam. So we went for a drive further up the coast, lightning storms on our right, storm clouds blowing in from the sea on our left. An old concrete construction, possibly an uncompleted marina, a common enough site on the Italian coast, seemed to offer a possibility for a seascape. Several things came to mind in this bleak and stormy place. I grew up by the sea, my father was in the navy, he used the expression ‘on the beach’ meaning never to go to sea again, career’s end. 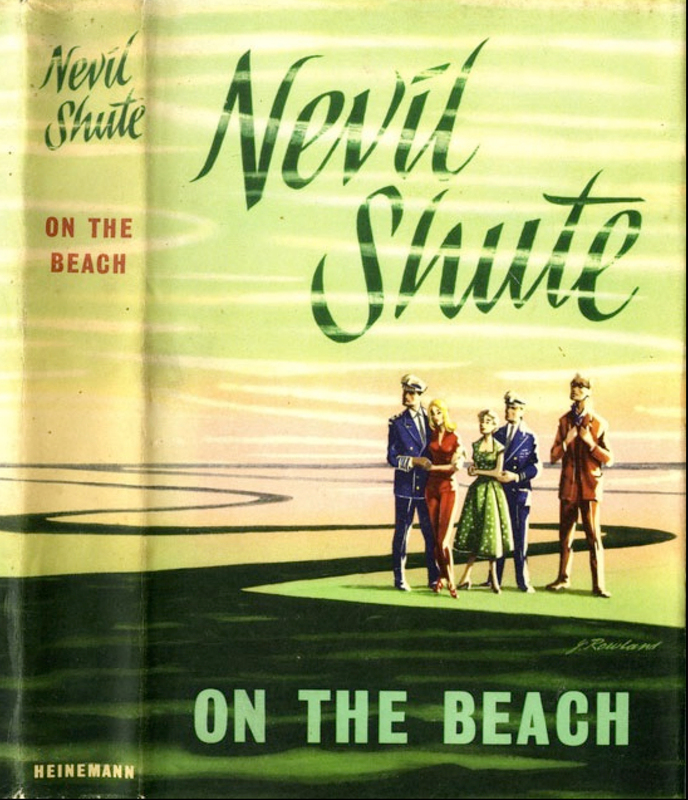 The desolate concrete pontoon reminded me of the cover of Nevil Shute’s book On the Beach about a group of individuals waiting for a spreading nuclear cloud from the Northern Hemisphere to overcome the last surviving humans in Australia. I thought of The French Lieutenant’s Woman, the heroine standing forlorn on the Cobb at Lyme Regis. I took a shot with a neutral density filter and showed the result to her; she was impressed. The wind was howling, the breakers crashing, the spray blowing, “what about it?” For a moment she thought I was joking, but then she realised that this was the moment. She stood almost as still as a figure-head for several minutes, waves breaking over her, soaked with spray, covered from head to foot in seaweed! I was completely unable to make myself heard. I took eight shots in just a few minutes and beckoned her back. We had done it. The weather worsened. As we sat in the car looking at the shots on the computer, the sky darkened, the storm surged in on us. This is the time of year when the ancient Greek poet Hesiod warned seafarers to haul in their boats as the Pleiades appeared in the autumn sky, the stars known in mythology as The Seven Sisters. but, as I bid you, remember to work on the land. We drove past the ruins of the Etruscan city of Vulci and the more recent mediaeval castle. 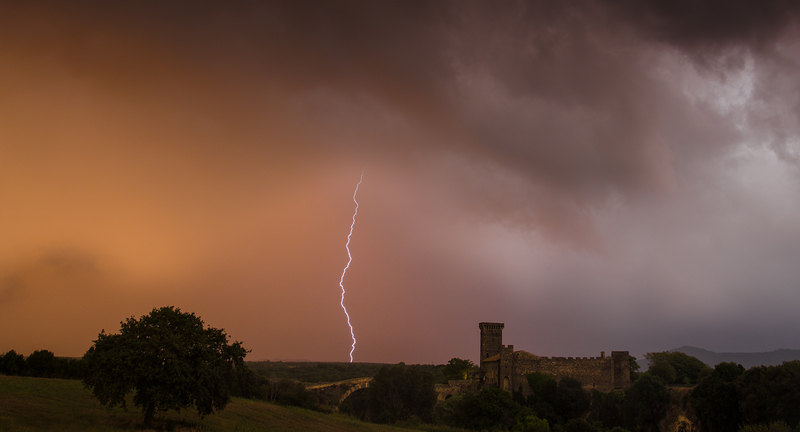 I stopped to take a photo of the lightning storm behind the castle. The Etruscans of two and a half thousand years ago identified twelve different kinds lightning to divine the will of the Gods. The essentially primitive Etruscans differed from the later more sophisticated Romans with a system of belief that involved understanding and living in harmony with nature. Storms have worsened of late and this summer in Italy was the wettest on record. Now autumn was bringing flooding and chaos. We headed home through the lightning storm, streams broke their banks, torrents appeared from nowhere, trees had fallen across roads, roads were blocked, it took hours to get home. A woman stands alone on the beach, but in actual fact she is not alone. She remembers when she was little, standing weeping on the beach holding her father’s hand as the autumns storm rolled in obscuring The Pleiades. The stars will emerge again, he reassures her. In Whitman’s poem On the Beach at Night a father and little daughter are staring up at the autumn sky. She weeps in fear of the gathering storm, he comforts her, removes her tears, reassures her that the stars will not be long gone; more than this he assures her of something older than the stars. I would like to reassure my eleven year old daughter that I will always be with her, standing beside her for the rest of her life; as long as she remembers me I shall be there in spirit. Love the great survivor, spreading like a radio wave out through the universe beyond Jupiter and the Pleiades for ever and ever, a father and daughter holding hands till kingdom come.